Noah Sowers is having a big senior campaign for DC. Noah Sowers remembers when he first fell in love with basketball. Eleven years ago, Sowers’ parents signed him up to play basketball through the Dodge City YMCA. That was in third grade, now the 6-foot-2 senior is off to a great start in his senior season with the Dodge City Red Demons. 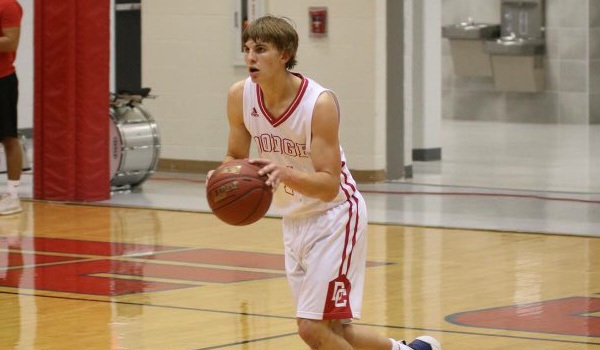 Sowers is currently averaging 20.1 ppg, 6.9 rpg and 6.1 apg going into the 76th Annual Dodge City Tournament of Champions that will begin on Thursday and run through Saturday at United Wireless Arena. Other teams in the field of eight will be Bishop Carroll, Derby, Hutchinson, Junction City, Newton, Shawnee Mission South and Wichita North. Sowers was a First Team All-Western Athletic Conference selection a season ago after averaging 15.8 ppg and 5 rpg as a junior. He started all 21 games last season and has started all eight this season. Sowers has scored in double figures 26 of his last 29 games that he’s played in going back to the beginning of his junior year. He also shot 44% from the field and 35% from behind the arc as a junior. This season has been more of the same for the senior. Sowers is currently shooting 46% from the field and is averaging nine attempts to the free-throw line every night. His season-high this season is currently 25 against Maize on Dec. 7 and also scored 23 against McPherson on Dec. 20. Sowers is eager to play this week at the Tournament of Champions one final time, as he scored a career-high 30 points in last year’s tourney against Leavenworth. Sowers also tied the school’s most three-pointers made in a single game in that game with seven. Although Sowers has been playing basketball for over the past decade and will more than likely be another First Team All-WAC selection, he’s had trouble getting recruited in western Kansas. Sowers is also a threat on the baseball diamond and has earned First Team All-WAC performances the past two seasons. 2. What are your plans after graduating from high school? Don’t really know for sure yet. Would like to play college basketball somewhere. If that doesn’t pan out then go to Wichita State University and get a business degree. Rob and Jennifer Sowers. My father is an insurance agent for State Farm and my mother is a special Education teacher at Comanche middle school. Hannah Sowers my sister swam at the university of Sioux Falls. It’s a D2 in South Dakota. high school? If yes, when/what did you earn? 6. Do you have a job outside of school and basketball? 7. Any major injuries in the past? What was the injury and when did this occur? 8. How many years have you played basketball? What got you interested in playing? just fell in love with it. Been playing for 11 years. 9. Career highlights as a basketball player? 10. What do you want to major in when you reach college? 11. What is something most people don’t know about you? 12. Interesting life or basketball story? burns on my right arm. 13. Any superstitions? I eat KFC famous bowl before every game day. 17. What are some strengths of your game? Weakness? Strengths: I feel one of my strengths is getting down hill and putting pressure on the defense. I also feel I put pressure on the defense by kicking the ball up. Weakness: I feel as if I could improve on the Defensive side. 18. Who’s had the biggest impact on your basketball career? Why? Coach Starnes. He is the one who’s always believed in me when I really never thought I had a basketball future. He has had a tremendous impact on my basketball career.